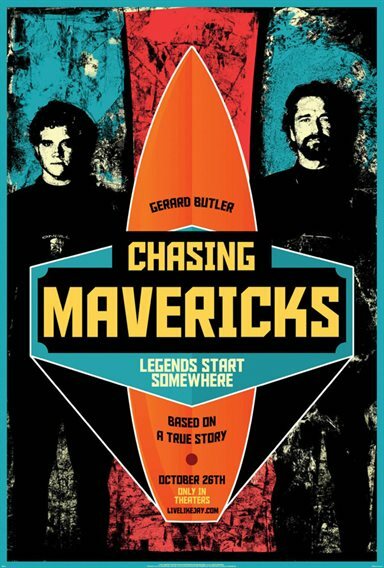 Download Chasing Mavericks in Digital HD from the iTunes store. Chasing Mavericks images are © 20th Century Fox. All Rights Reserved. You don't have to be a surfer to enjoy the true story Chasing Mavericks, a bio drama that's filled with inspiration and determination. Now on Blu-ray the movie has a fine cast and crew with a script that takes you deep into the life of a real surfer and his willpower to catch the biggest and most dangerous waves. If you like dramas that are capped by the love of a challenge and the heartbreak of a broken home then ride these waves. 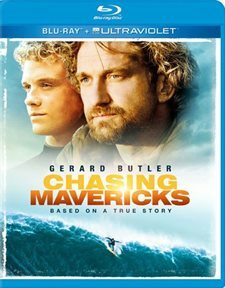 The movie centers on Jay Moriarty (Jonny Weston) a 15-year-old with the spirit to achieve his lifetime dream, ride the monster waves called Mavericks. He's in the right place because his hometown Santa Cruz is a surfing Mecca. Nicknamed "Surf City" because you can shoot a wave all year round, there's always a wild ride some small and others gigantic. He gets to know his neighbor Frosty Hesson (Gerard Butler) a pro surfer who has seen more action than most. Wanting to be like Frosty he asks for his help to teach him how to ride the big ones. While Frosty doesn't think he can handle huge waves he decides to mentor the young man because of his determination and spirit for the sport. Jay works hard with Frosty, but being the only man around the house his job to help support his mother (Elizabeth Shue) puts pressures on his dream. His love life is just blossoming with Kim (Levin Rambin) and this distraction has caused stress with Frosty. Frosty's family life with two children and a supportive wife also works against Jay's goal. When all these worlds start to collide, Jay must find a way to make his dream come true. Under the fine direction of two consummate filmmakers Curtis Hanson (The Hand That Rocks the Cradle) and Michael Apted (Coal Miner's Daughter) the film takes shape from a winning script featuring a boy against a wave that's between him and his dream. The two guide their actors, stuntmen, pro surfers, multi-cameras, creative staff and much more to bring this inspirational film to life. Their main character Jay played by Weston handles his role with ease, making surfing look tough showing his will to succeed under the most ominous conditions of waves up to 50 feet high. Getting in on the stunts, Weston gets to do some surfing in both the studio and on the real waves. His mentor Frosty, characterized by Gerard Butler gets to do the same. Butler takes to water extremely well considering he's from Scotland where he was landlocked most of his life. But, here he shows his stuff taking some chances on a tough wave for the camera. The movie is really a family film with a PG rating for thematic elements and some perilous action. Much like 2011's Soul Surfer, the movie takes on a lot of personal problems including teen angst, young romance, and self purpose with the addition in this film of dealing with a death, bullying and divorce. Don't let the PG rating fool you into thinking the film plays only to teens or surfer dudes, Chasing Mavericks plays to all ages. The film excels with Bonus Features that are fun, interesting and creative. "Surf City"- this extra reveals the reason for choosing the home town of Jay Moriarty even showing archival footage of the surfer. Producers, crew, the real Kim Moriarty wife of the surfer and Gerard Butler run through how they shot the surfing, and story. "Shooting Waves"- goes into the "making of" especially the surfing part where the crew used anywhere from 9 to 12 cameras during a scene shoot. Here pro surfers, stuntmen, actors and director go over the difficulties in filming the many hours of water affected shots. "Live Like Jay"- takes on a personal touch talking about Jay by the real people who lived the story including Frosty Hesson and Kim Moriarty along with the actors Gerard Butler and Levin Rambin. "Surfer Zen"- this little feature explains the feeling of surfing though the personal views of the pro surfers and actors. They'll even tell you how to shoot a wave. "Deleted Scenes"- There are 5 deleted scenes to view for added content not shown in the movie. "Audio Commentary"- you can turn on the audio commentary and listen to Director Michael Apted and writers Brandon Hooper and Jim Meenaghan. The Blu-ray quality is crisp and clear and you can almost feel the spray from close-ups of the towering waves. The colors are extremely vibrant at times, especially the cliff lined coast of Santa Cruz. I was especially impressed with the shots of the night surfing where you can see the wave riders very clearly. With the widescreen 1.85:1 aspect ratio, the movie fills the whole screen on my 16x9 HD Television. The sound quality using the DTS-HD Master Audio 7.1 comes across strong and clear. I witnessed no distortion and could easily hear all the dialogue, even during some of the most thundering surf. My additional speakers even pick up some of the back and side sounds during several scenes.